Grip-maximizing tread compound, for indentation in the ground whatever the temperature. Unique V-Shape tread-pattern with wide grooves, for optimal water and snow evacuation. A rigid sculpture with 3D self-locked sipes, to improve dry braking performance. V-Shape sculpture, with massive tread-blocks for optimal gearing. Full-depth sipes with sharp edges, for long-lasting clawing effect. Wide grooves with self-cleaning capacity. 4 levels to monitor the remaining rubber depth (0% = Legal Tread Indicator reached. Tyre needs to be changed). 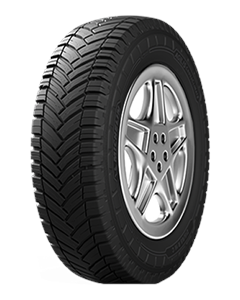 Easy to monitor tyre wear, hence reducing maintenance downtime.